Economy plus or Business minus? This has been the perennial question for Premium Economy class passengers since Taiwan’s EVA Air introduced the cabin class in 1991. Since then, more airlines have joined it in offering a Premium Economy product as a bridge to the ever-widening gap between Business and Economy class. Singapore Airlines is the latest entrant to the market, having held out for several years while the airline built a business case and gathered passenger opinion for a new product. We join the Star Alliance carrier on a regional hop from Singapore to Hong Kong to find out more about its new Premium Economy class. 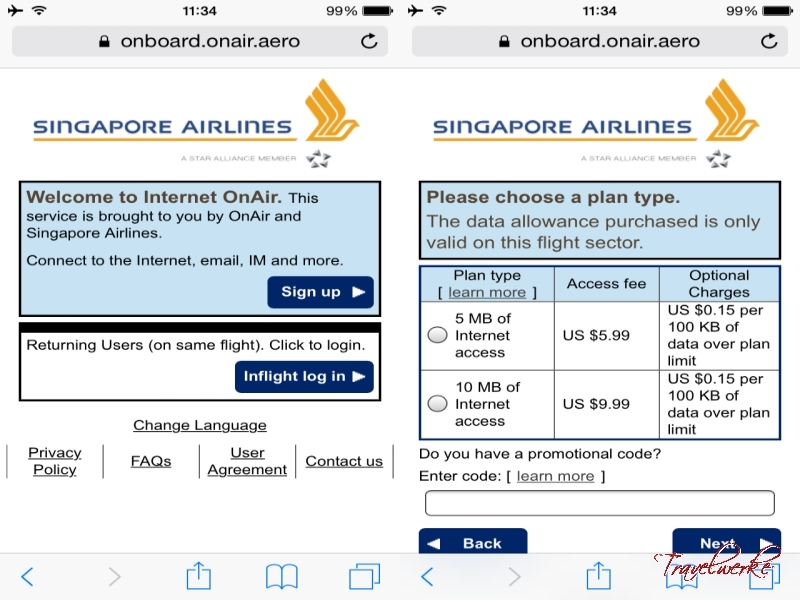 Singapore Airlines offers multiple check-in options (online, mobile, self-service kiosk and counter) for its flights departing Changi International Airport. 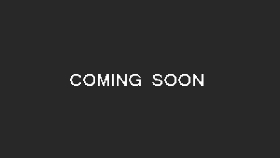 Row 7 in Terminal 3 was allocated for Premium Economy Class / Krisflyer Gold passengers. 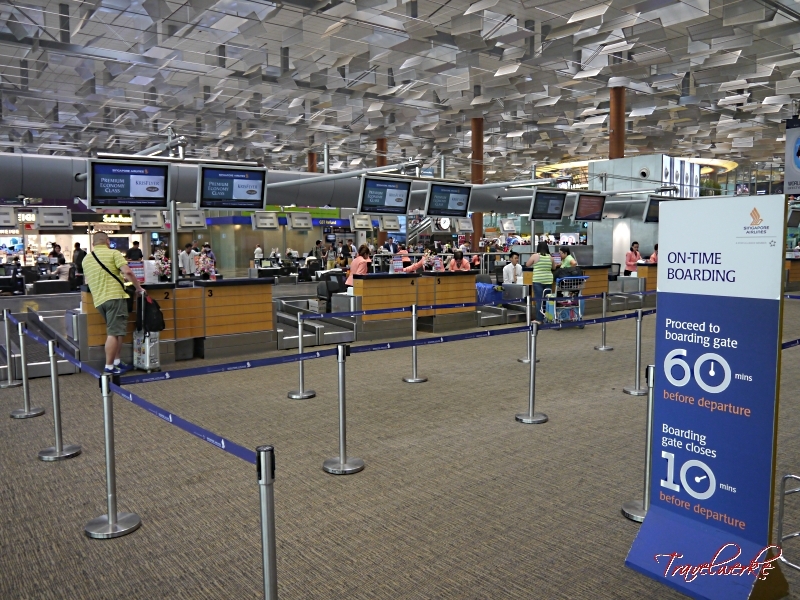 We were met with a queue despite 5 counters open, although the line was constantly moving along and we were soon attended to by the ground agent. This was also the point where inconsistency set in, with points lost here given our agent was seemingly focused on clearing passengers without any interaction or smiles, while the agent at the next counter was cheery and made the effort to engage with passengers. Gate B7 opened for passengers approximately 1 hour before the scheduled takeoff time. By the time we arrived at the gate, the ground crew had begun boarding the aircraft with priority boarding by cabin class strictly enforced. We also liked how there were security and boarding pass check lanes reserved for Suites, Business, PPS Club and Star Alliance Gold members, which smooth ended the entire process. 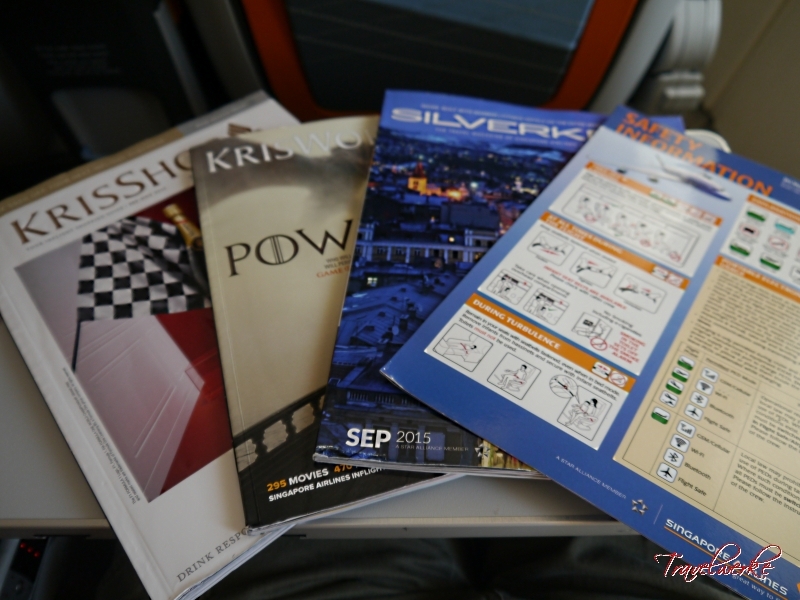 Stepping onto the aircraft, we were greeted by the friendly crew and directed to our seats, situated in a mini cabin tucked between Suites and the lower-deck Economy Class section. With just 32 seats, the ambiance during boarding did not feel rushed with no pressure that we were holding up passengers headed further back. 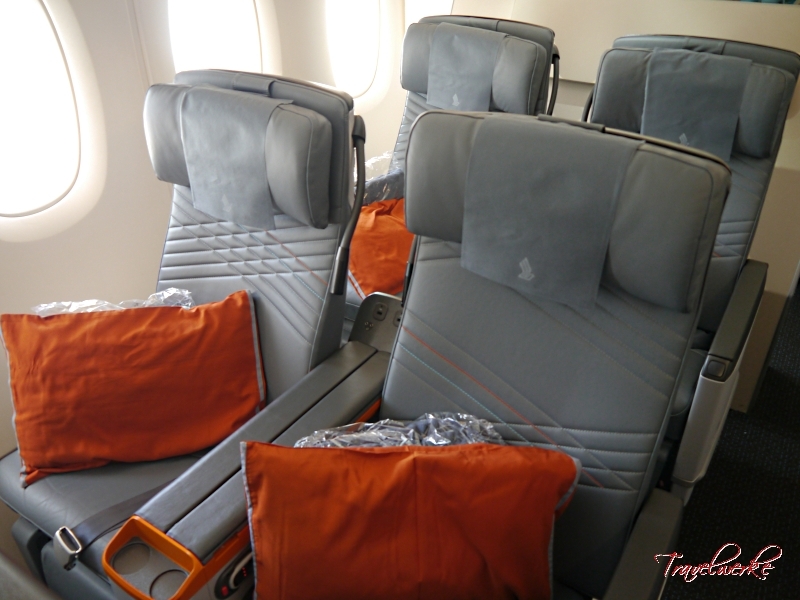 Introduced earlier this year and entering service in August, the new Premium Economy seats are upholstered in a stylish grey leather with orange accents. Seat pitch was a generous 38 inches allowing us to comfortably cross our legs when seated, while the 19-inch seat width allowed lateral movements. The curvature of the A380’s main deck also gave window seat passengers added shoulder and elbow room, further contributing to the greater sense of space in the cabin. 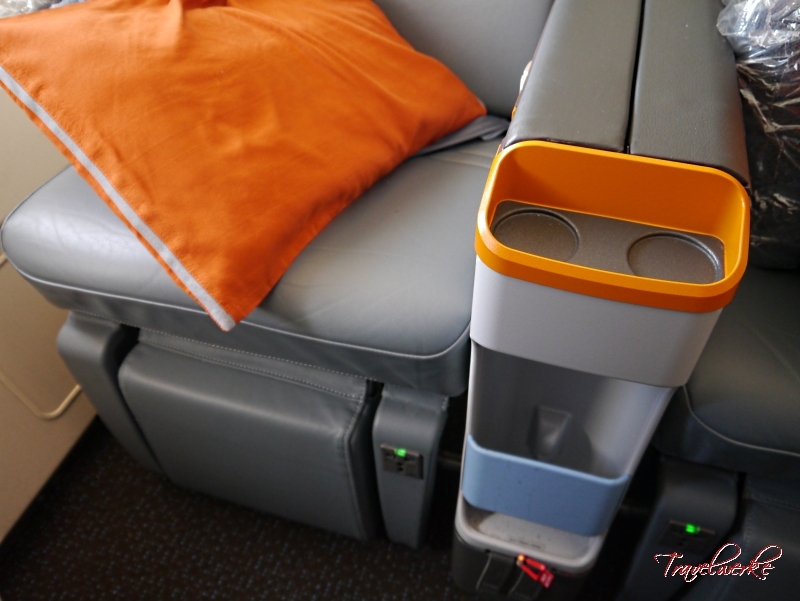 Complemented by a 8-inch recline and padded leg rest, this was a very comfortable seat for the 4-hour flight up to Hong Kong and more than adequate for longer sectors that the aircraft will fly. Passengers are also provided with a larger pillow and wool blanket. A center console gives each passenger his/her own armrest, as well as housing the large tray table, drink holder, IFE remote and seat controls. 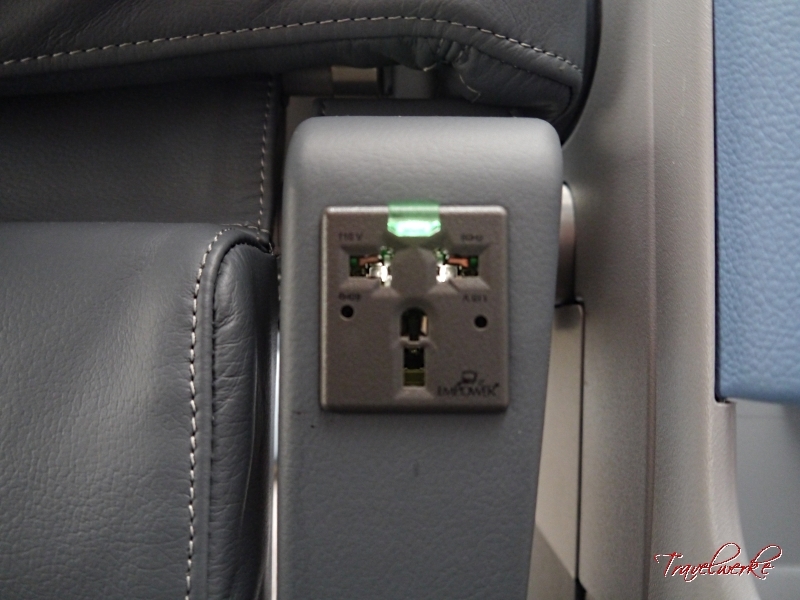 Every seat pair also has a pocket at the front of the console for bottled water, another added amenity for Premium Economy passengers (although this was mot available on the SIN-HKG sector). 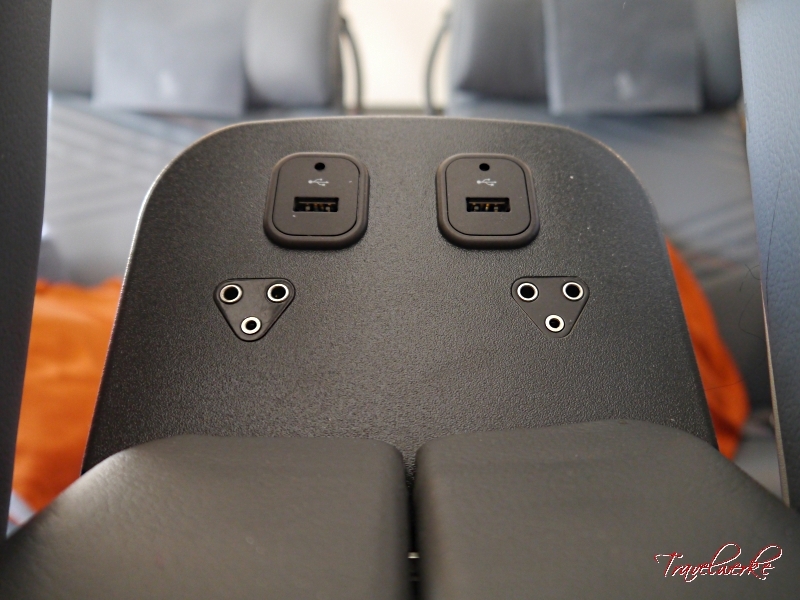 Accompanying the entertainment suite is a pair of USB ports (conveniently positioned below the monitor and above the armrest near storage pockets) for charging personal electronic device, as well as an electrical outlet by the footrest. The crew operating our flight were fantastic in every way, delivering flawless service from boarding up to disembarkation. 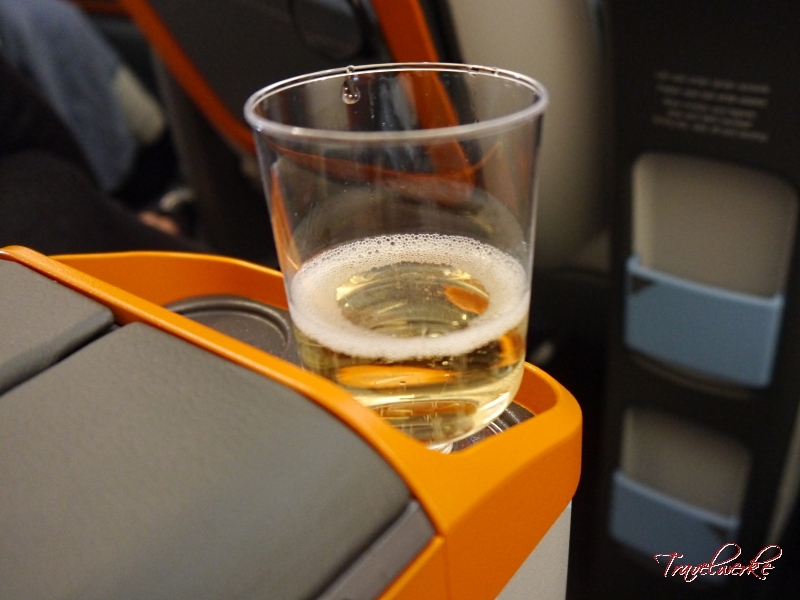 Our aisle was served by a leading stewardess who was efficient, professional and friendly. Despite criticism of SIA girls being robotic and lacking the personal touch, we found this to not be the case on this flight and the crew were genuine in their engagement with passengers. 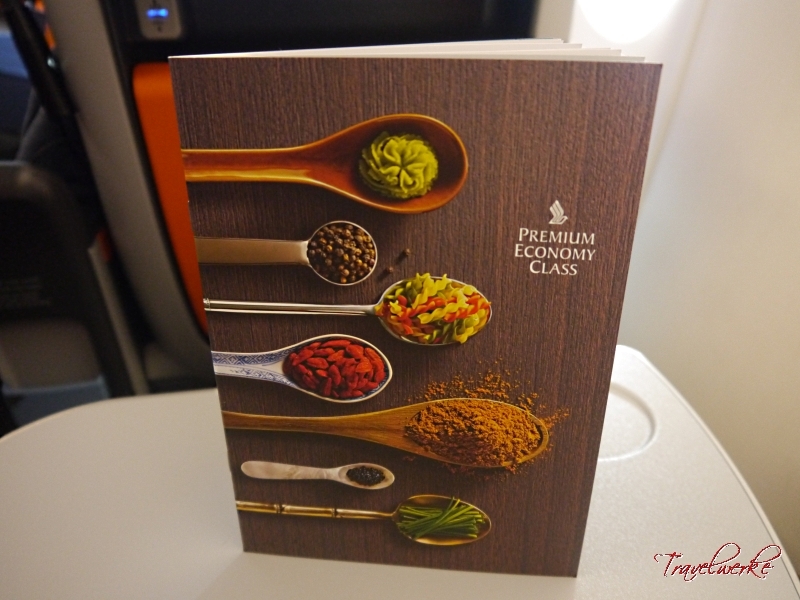 Premium Economy dining is enhanced over Economy Class in the form of a choice of bread, 3 options for main courses and the addition of champagne to the beverage menu, which we elected to have during the initial drinks service. Singapore Airlines has selected the Champagne Ernest Rapeneau Brut Selection, an award-winning label with hints of figs and apricots that paired well with our choice of main course. The popular “Book-the-Cook” pre-order service (previously available only to Suites, First and Business Class passengers) has now been extended to Premium Economy Class. Prior to departure, we had selected the Nasi Lemak with Fried Chicken, which was served with the requisite peanuts with fried anchovies and sweet chili paste. With the exception of a larger, napkin-lined tray, we felt the meal’s presentation was more in-line with Economy Class with the use of a disposable plastic casserole as opposed to a ceramic dish. Portions were also rather small, but compensated in the form of fragrant coconut rice, chunky chicken pieces, fish cakes and egg frittata. 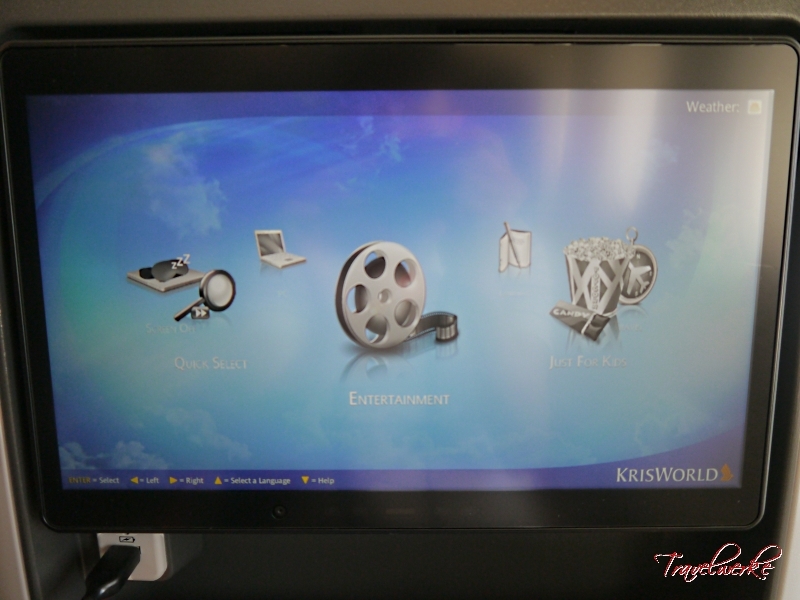 Immediately ahead at eye level is a 13-inch high-resolution flatscreen monitor showing content from the KrisWorld inflight entertainment system. 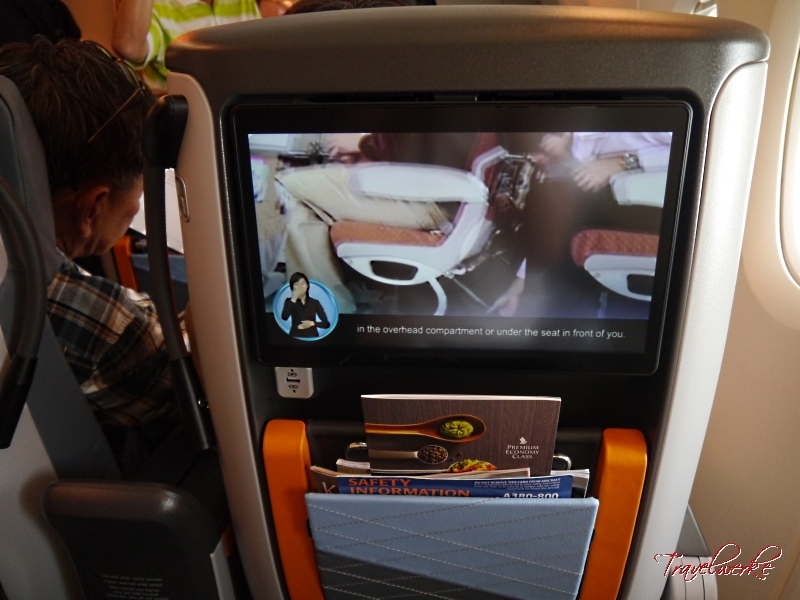 The larger format over the Economy Class monitor was definitely appreciated when viewing the extensive collection of on-demand movies, television features, music and games. 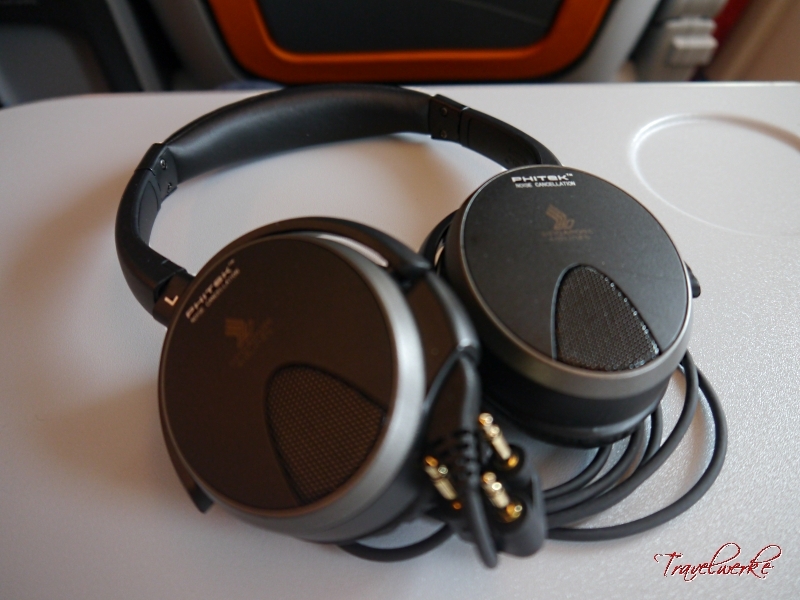 Audio delivery is also improved over Economy Class via the supplied Phitek Systems noise-canceling headphones, although we found these to be less comfortable to wear compared to other headphones in the market over the length of the flight. The aircraft was also fitted with mobile and internet connectivity from OnAir, which can be easily accessed in the same way as connecting to a Wi-Fi hotspot on the ground. Flight SQ 856 descended into a sunny Hong Kong and touched down on-time on Hong Kong International Airport’s runway 25R. The jet docked at gate 15 near the immigration hall following a short taxi, saving passengers a lengthy walk through the massive terminal building. Premium Economy class passengers were held behind the drawn curtains for Suites passengers to disembark first, but no separation was in-place with Economy Class. 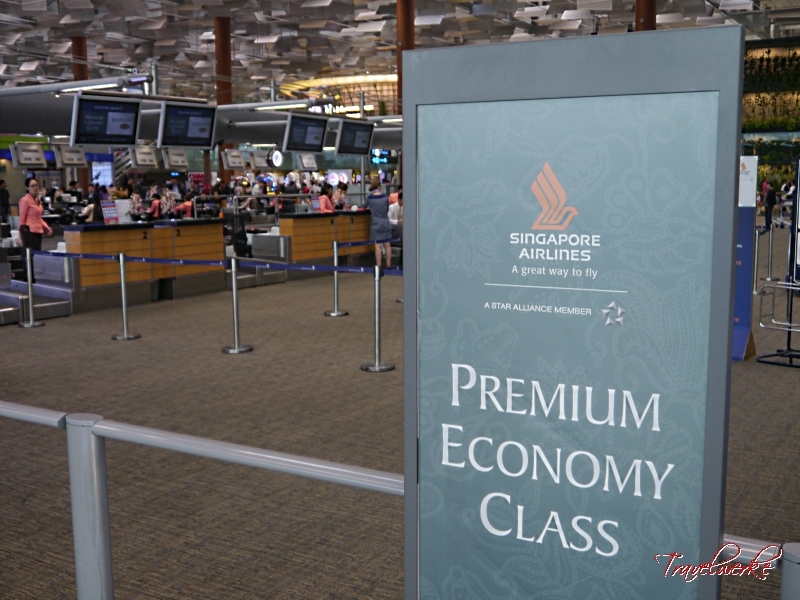 We felt that Singapore Airlines can improve in this area by allowing passengers in Premium Economy to leave the aircraft before Economy Class passengers, given how the former already enjoy priority baggage delivery and boarding.